Cellophane bees like 70% of solitary bees nest underground and often receive a bum rap due to confusion with ground nesting yellow jackets. Yellow jackets are not bees but wasps and like most wasps are predators preying on insects. In addition, yellow jackets are social insects (like honeybees and bumble bees) living in hive and are on high alert to serve and protect the single egg laying queen. Cellophane bees and mining bees are different. In the realm of solitary bees every individual female lays her own eggs and provisions them with “bee bread” a mixture of pollen and nectar. 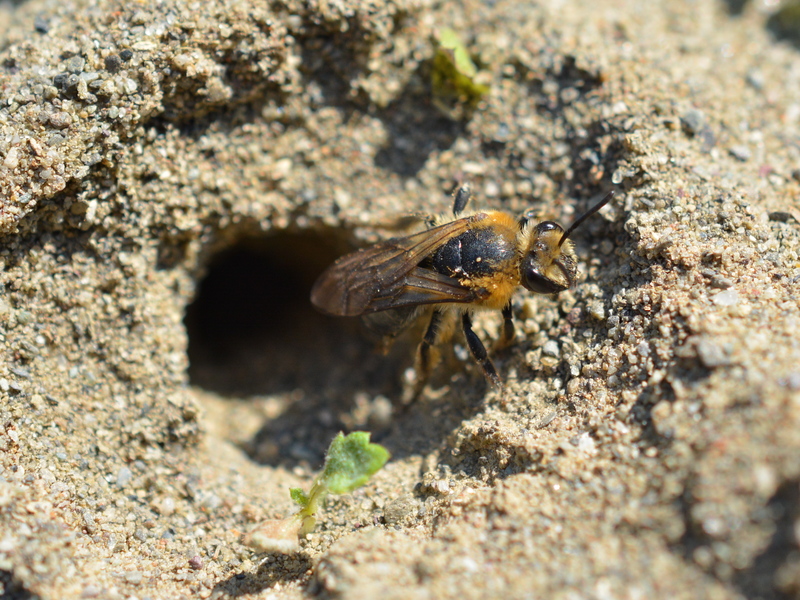 Solitary bees that nest underground are practically harmless to humans and it is reported that the mining bee stingers do not even penetrate human skin. I can personally attest that I have sat in the middle of a nesting aggregation to photograph them and the bees simply waited until I moved, if I happened to be blocking their nest entrance. Cellophane bee exiting nesting chamber. These cellophane bees were discovered in an old sand pit that provided them the perfect habitat in which to dig out their nest chambers. Cellophane bees are in the genus Colletes. 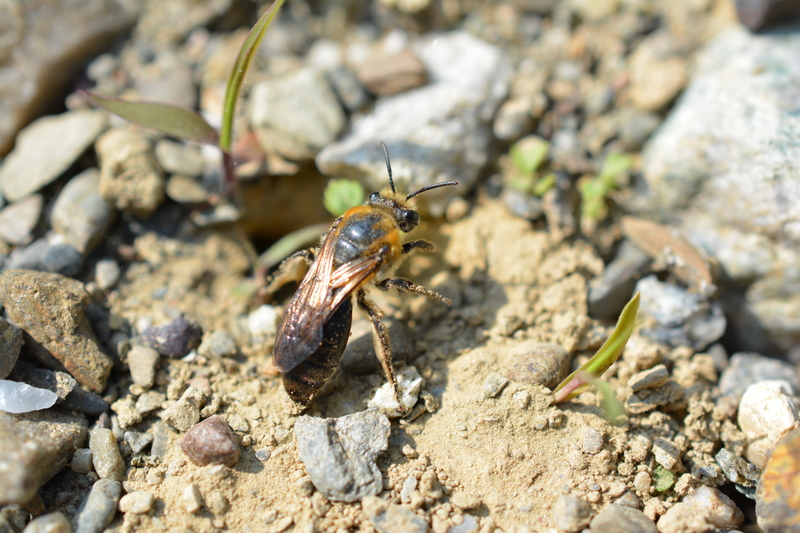 This particular species lives in a large aggregation of hundreds of bees in a area that most certainly is glacial outwash. The area they chose was free of vegetation and seemed beach like and very hot in the early June sun. 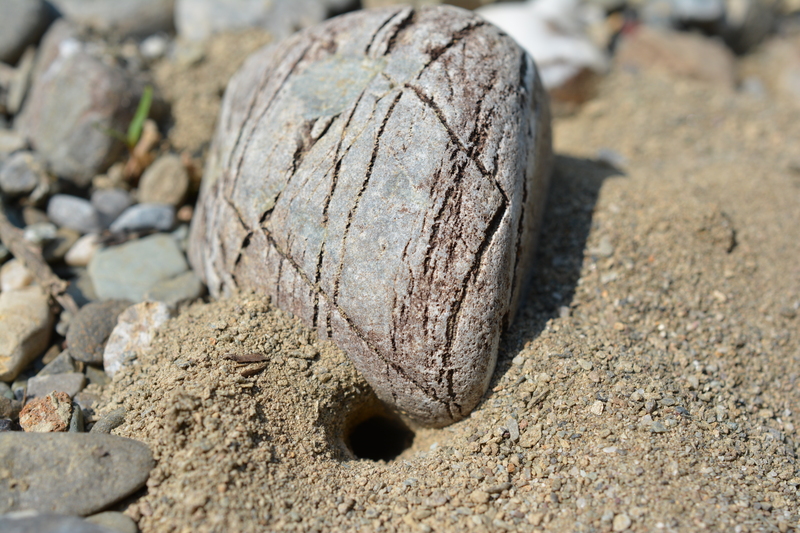 Some of the bees had created unique entrances under interestingly shaped stones, some chose entrances protected by twigs and leaves and others simply dug out their holes in pure sand. 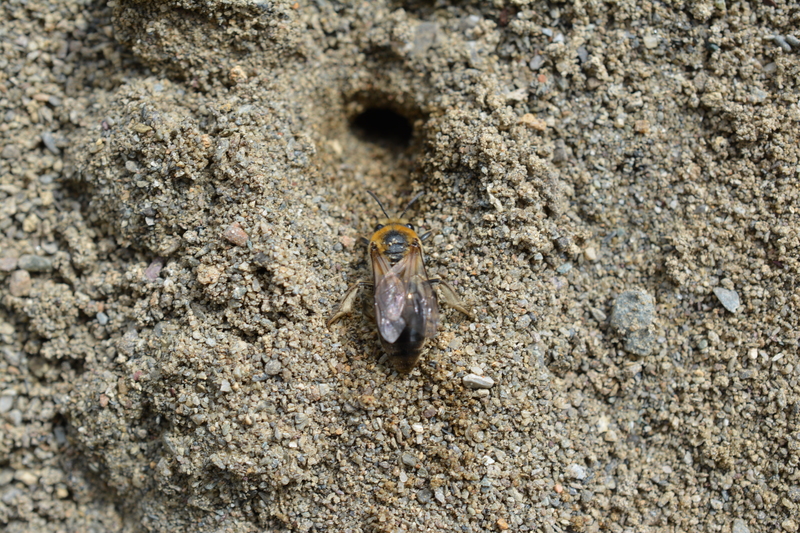 In other places, perhaps more established areas, the bees preferred to be cliff dwellers, nesting up the entire cliff until they reached the humus layer of the forest. My observations indicated that either they had more than one entrance to their nesting chambers or shared common entrances with other bees. 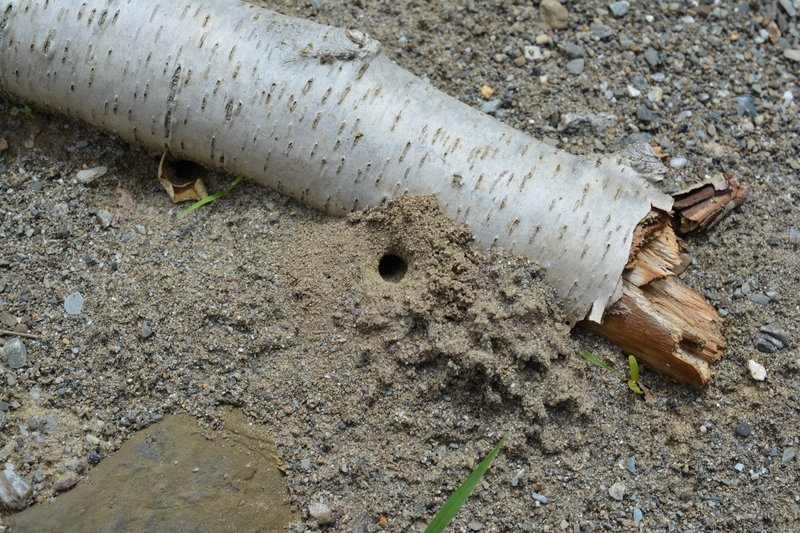 On close inspection, the females were observed digging sand out of the entrance holes. In areas, where the chambers were complete the bees were actively bringing in pollen to provision the eggs with a ready food source.